The fifth issue of your prime news source for everything Albion related brings you information on the state of the ZERG alliance and news of the battle for Redwater Cove. To read the Gazette like it should be read: download here. The ZERG Alliance on the verge of disbanding! A new chapter in Albion? Update: Reality was faster than our reporting: the alliance has started to break apart. We will follow up in one of the next issues of the Gazette. The ZERG Alliance is one of the major alliances of Albion that has shaken things up throughout a large portion of Closed Beta. However, the alliance appears to be on the verge of ending their united front on the West and breaking ties. We had a chance to speak with Cryon, the Warmaster of Conflict, and reflect on the history of the alliance beginning with just three organizations; Nilfgaard, Conflict and Echo of Silence (EOS). Although the three organizations clearly had similar aspirations in combatting against the ENVY alliance, there also seemed to be other organizations who shared a common goal with Nilfgaard, Conflict and EOS. As more guilds joined the united front, the alliance leaders began to establish the statutes that all stakeholders would abide by. “The alliance terms were simple. The guilds involved would unite under a single flag until Envy was pushed back to their home territory. The initial ZERG alliance was formed with Leadership from Nilfgaard, EOS, Killing 4 Fun, Conflict and Valhalla at the round table,” affirmed Cryon. After preparation phases for the ZERG alliance, including the formation of GvG teams, securing battle inventory and establishing a war plan, the battle began. Over the span of several weeks, the control over the black zones shifted back and forth between the two major alliances, with new guilds getting involved and shifting their efforts across the map of Albion. Although it seemed things were shifting in favor of ENVY, inner-alliance turmoil led Finstack into departing from the Envy alliance and joining the ZERG alliance as well, with a single goal: battle and contain ENVY. “The long war began to take a toll on both sides, especially considering that it went on over the span of several weeks. At one point, Money Guild (ENVY) was pushed back to their home base in Festerfoss (Mid-February), however, they held the chokepoints strong with their main GvG team and Festerfoss could not be breached,” Cryon said. With Festerfoss seeming impenetrable, it appears that ENVY had the upper-hand in ensuring that their home-base would remain safe at all costs. Not only were they able to secure their home territory, but guilds that shared a common interest with both Money Guild and Glaficom began to flock to the ENVY alliance as well. This solidified the alliance’s foothold across both continents even more. “They [ENVY] recruited additional support from the East, including powerhouses such as KDS and Titans,” Cryon told me. Although a number of united groups throughout closed beta have set forth powerful efforts to contain ENVY within Festerfoss, the alliance maintains a strong presence on the map and has endured every battle in the long run. With whispers of disbanding and the ZERG alliance on the rocks, the stakeholders involved will naturally have to plan their next move. Considering that a majority of the guilds involved in ZERG own a stake in Carrion Copse, there is the potential for an unexpected shift in control over the prized black zone. Although the possibilities are limitless, an unconfirmed source reported that “it is likely that the alliance will reform, excluding certain stakeholders and incorporating new ones.” Keep a keen eye on the upcoming turn of events, as the coming weeks of this war are bound to be interesting with the emergence of new alliances and rivalries. The battle for Redwater Cove; seemingly never ending! 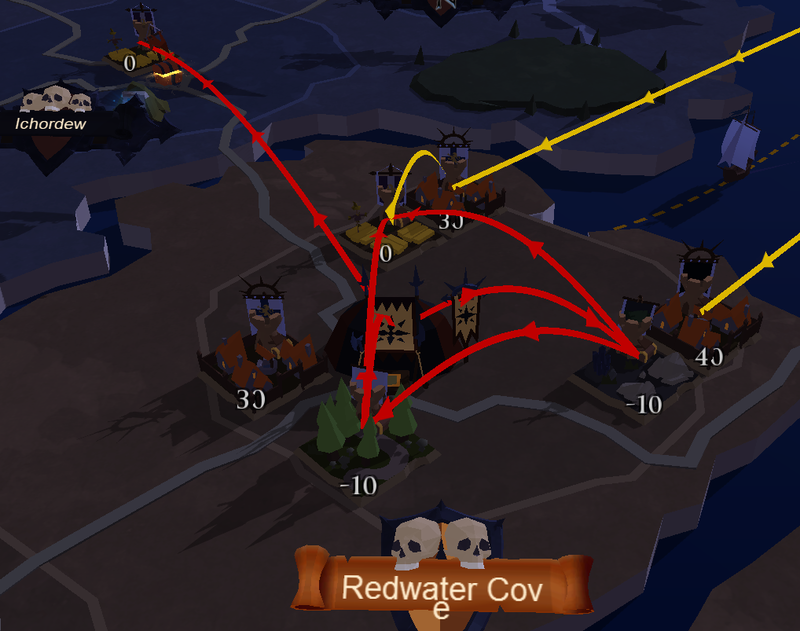 It appears that Redwater Cove is the new ‘Carrion Copse’, in terms of battle for control over the landscape. Currently, it is the GvG hotspot for an ongoing war between the ENVY and ZERG alliance as shown in the picture. Fairly recently, Finstack was able to seize the most western city plot of Redwater Cove from Dreadlords, removing them as stakeholders in the zone. With six different guilds involved in the battles going on for control over this single zone (including: Finstack, KDS, Money Guild, Nyx, Chicken Kiss and Echo of Silence), it is hard to assess who will end as the victor in the ongoing war. When factoring in the current state of internal affairs for the ZERG alliance (talks of disbanding and reformation), chances are that there will be an eventual shift of control over Redwater Cove that may tip in favor of the ENVY alliance. However, only the coming weeks will truly tell the outcome. With the war camp available to any organization that may want to stake their own claims over the zone, Redwater Cove is simply a prime location for anyone looking for a fight. As new GvG teams are continually being formed and shifting up the team composition meta, we are in for a treat to see which organizations will rise as combatants in the continued War of the West. Share your thoughts and war stories on our forums.